Australian horror psych‐punk’s Horace Bones are a four piece that play loud, liberating and belligerent rock ‘n’ roll. Born from the remnants of a house they’ve shared/soiled since early 2015, the band comprises of members: Christian P Fish (drums), Caz (lead guitar), Danny Cockburn (bass) and Oisin Kelly (guitar/vocals). Since releasing their debut single Tarantula to wide spread praise and horror, their music has established extensive, national radio play and a coveted spot on the Home and Hosed, top 5 songs of the week. Cutting their teeth on stages shared with the likes of Pulled Apart By Horses (UK), Lurch & Chief, Remi, Bad//Dreems and Money For Rope has seen each show mount with sweaty uproarious anarchy. Add to that, a signing to boutique management label, Thirds Music, and a spot on the bill for this year’s NYE On The Hill Festival, Horace Bones’ trajectory continues to rocket skyward. 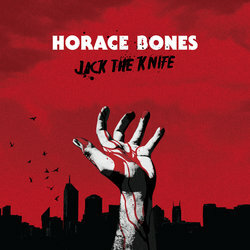 After touring the country 3 times over since the start of the year, Horace Bones are now set to unleash their third jingle, the venomous, ‘Jack The Knife’, taken from the band’s forthcoming EP, ‘Son of The City’. Employing Birthday Party-esque bedlam encased in 60’s garage/ surf-rock revelry, ‘Jack the Knife’ by Horace Bones will have you singing along down dark alleyways, while always looking over your shoulder.